Nelson Street in Bristol’s City Centre was a buzz on Saturday as the party got into full swing. But of course it’s all been about the painting. At the start of the week the walls were boasting a massive piece by Ayrz from Barcelona, a fresh mural from New Yorkers the TATS CRU, a huge black and white piece by Shoe from Amsterdam and the making of a piece by Mr Wany from Italy. Now as the party comes to an end there are further pieces on the main street from El Mac from LA, Mau Mau, Xenz, Cheo, Jody and a giant vandal by Bristol’s Nick Walker and many many more. 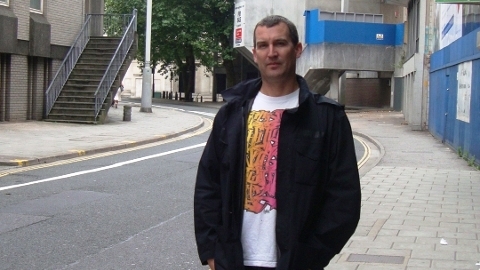 If you still haven’t been down to check it out but do intend to, make sure you meander off the main road as up steps, around corners and in alleys you’ll find some of the Bristol artists we all know and love including Richt, 45RPM, Tom Hine, Paris, Milk and Andy Council. Here are a few pics from the first days of painting- for a full set of pics, which were updated as the week progressed please visit. 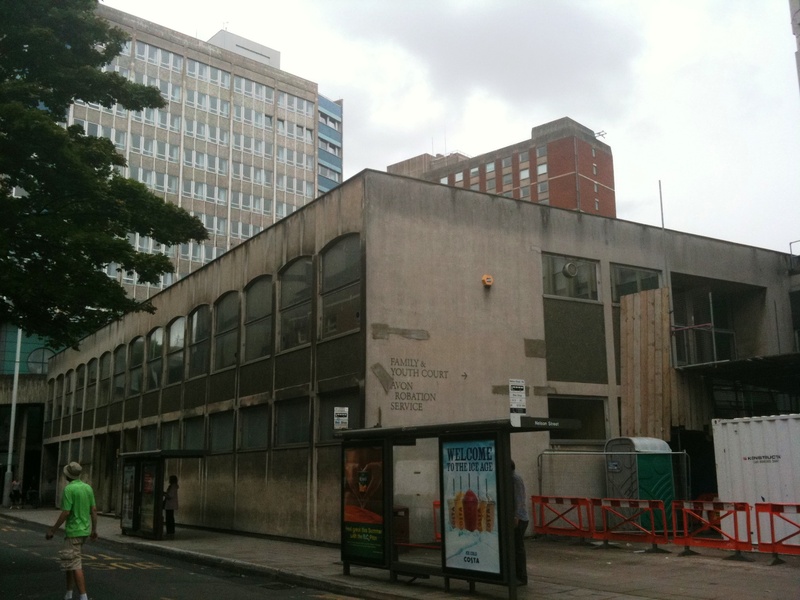 BIG plans for Nelson Street in Bristol city centre have now been publicly revealed. Over 30 UK and international artists will be in town from the 14th to the 21st August busy transforming the dingy streets’ grey concrete buildings into something spectacular. Some of these buildings are in access of 50ft tall so there are going to be some HUGELY impressive murals on show, in fact quite possibly some of the largest in the world. 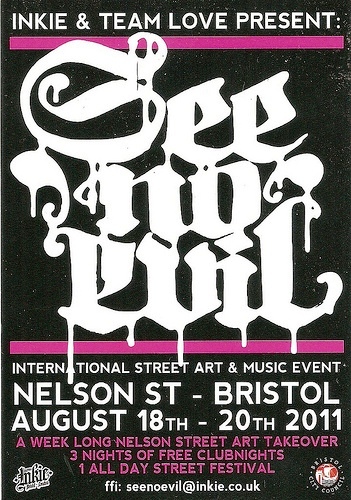 Organisers, including Bristolian graffti artist Inkie aka Tom Bingle, hope that – See No Evil – will be the biggest local art event since Banksy took over the Museum of Bristol in 2009 giving the city a massive boost. The road will be closed for the weekend of the 20th & 21st August for a street party, with local traders opening street stalls, music and pop up bars on the ground floors of some of the vacant properties. There will also be workshops so people can learn more about the art form. 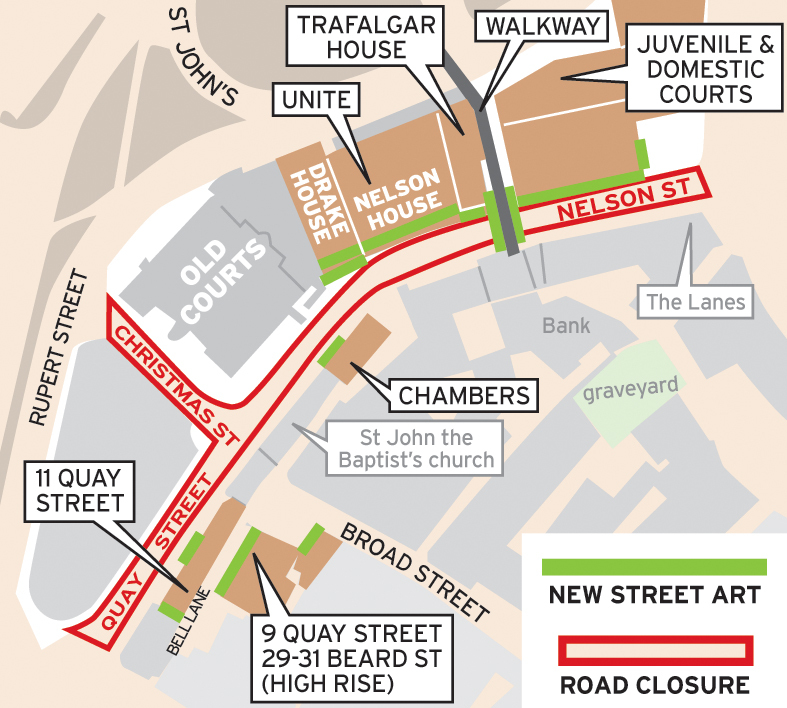 Nelson Street has capacity for up to 5,000 people at any one time, but if there are more than that then the other access points at Christmas Street and Broad Street will be closed off. Visitors would be let in at the Colston Avenue end of Nelson Street, and leave at Union Street. Participating international artists include El Mac (LA), Smug (Australia), Tats Cru (NY), Swanski (Poland), Wow 123 (Germany), Neils ‘Shoe’ Meulman )Holland), Mr. Wany (Italy), Revert (France), Kashink (France) & Otto Schnade, (Chile) and of course there will also be many of your favourite UK artists including Inkie, Nick Walker, Kid Acne, Mr Jago, Soker, Xenz, Paris & Cheo to name but a few. Make sure you’re there and witness history being made!